Restoring backups is very straight forward, you will be asked to select if you want to restore from an IP server or from a local datastore. In case you choose the former option, you will be presented a dialog box that should already be familiar. It allows to set an IP or FQDN, a port and a remote path. This data will be used to connect to the remote server over SSH, so you should have an SSHD server running at the remote server and listening on the configured port. The remote server should have been previously added as a linked server to ease operations. In case you choose the latter in the first menu selection box presented when entering the Restore main menu option, you will be shown a form prompting you to choose a path from the local file system. Just browse your local FS and choose a folder where to search for backups. Remember to use the space bar to select the folder. It will not be selected until it appears in the path, which will only happen after selecting it with the space bar. Adding a forward slash at the end of a path will present its contents in the right box. The restore module has been kept in the command line, as it offers more flexibility, so once you select the source of your backups, you will be redirected to it. 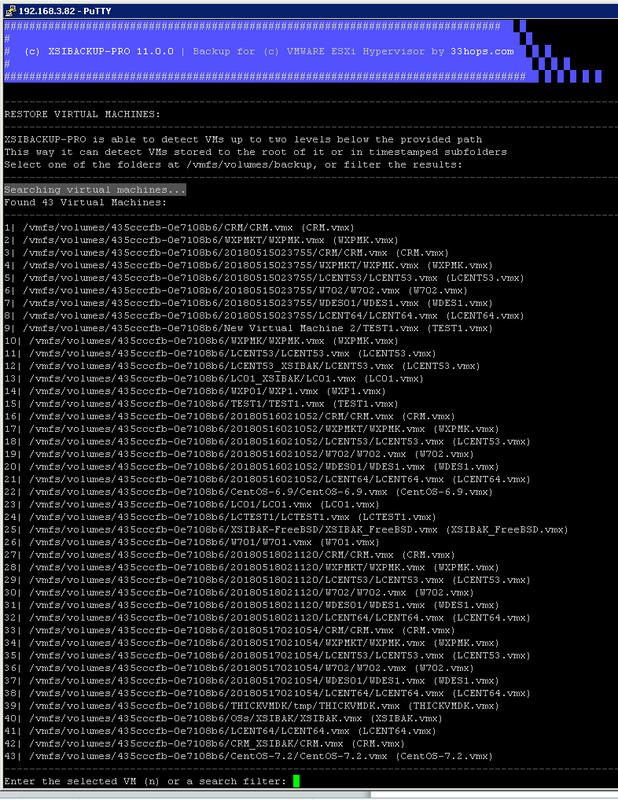 A list of available VMswill be shown onscreen. You will be prompted to select one of the ordinals preceeding each VM or to input a search filter. Say you want per instance to select all backups of the VM named CRM. You just have to enter that search pattern and the number of VMs printewd onscreen will be reduced to the number that matches your search. You just have to then choose a new ordinal to select the VM to restore. You will then be asked to say where you want to restore your VM to; just enter a directory name. Now you will have to choose which binary program to use for the restore process. Rsync is slower, but it allows to preserve the VM structure as it was when the backup took place, so you will most probably want to use Rsync if you used Rsync to perform the backup because you wanted the existing snapshots there to be preserved. If on the contrary you performed your backup by using Vmkfstools, using Rsync now will be useless and will only delay the restore operation. XSIBackup allows you to restore to different types of virtual disks if you choose Vmkfstools, as the restore program. This is the next question you will be required to answer as the restore proccess continues. You should have at least a basic understanding of what each type of disk is and what are the pros and cons of each type. If you don't know just choose option 1 (thin). After being prompted for confirmation, the restore progress will be shown. 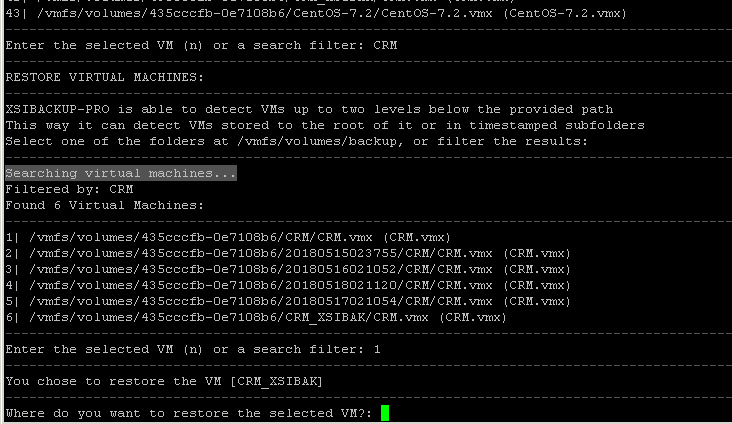 Once the restore process finishes, look for your VM's .vmx file using the vSphere client VM browser and add the VM to the inventory if you want to use it.